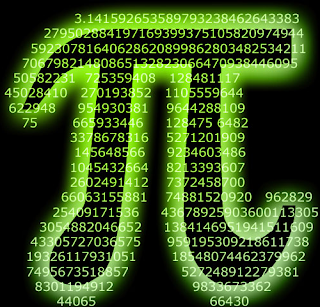 http://www.piday.org/Tomorrow is Pi Day because in the way Americans write dates March 14 becomes 3.14 which are the first three numbers of the number Pi, if you get what I mean. So mathematicians and bakers around the world will be celebrating tomorrow as they do every year. People apparently celebrate in all sorts of ways – in one school kids had to memorise the numbers and the kid who won got to 181 digits, he was in fifth grade. In other places kids get to throw pies in teachers faces. When I was a kid we had pie nights which had absolutely nothing to do with Pi. They were usually held at local sporting clubs where the boys got together and ate Pies with sauce, while their fathers sat around and drink beer. And for any Yanks who drop in here, our Aussie pies are made with meat, not whoosy fruit like apple or blueberry. Pies are main meals not desserts for crying out loud. But I digress, the days of pie nights seem to be long gone. Now kids eat pizza. I have to admit that maths wasn’t really a strong point of mine, even though I struggled through to first year university, it was a struggle and not something that I took to. So I’d be stretching things if I said that I could remember a lot about Pi. But there are a few things like Pi is the ratio of the circumference of a circle to its diameter. And if we are going to celebrate 3.14 then we should get really happy when we get to just before 2pm because that would be 3.14.1.59.26 or 34 seconds before 1400. Some people take this way too seriously, like this Canadian school teacher Mike Pretli “who shattered a 34-year-old Canadian record of 4,096 decimals for correctly reciting from memory the sequence of Pi. Pretli ended what he termed “the mental marathon” at 6,320 decimals.” This guy spent a year of his life memorizing 10 digit numbers and their sequence. And if you think that is a little weird you should know that the US record is 15,340, and the world record, 67,890, set by Lu Chao of China. And if you think I jest may I refer you to the official Pi Day website. Tomorrow is Pi Day because in the way Americans write dates March 14 becomes 3.14 which are the first three numbers of the number Pi, if you get what I mean. So mathematicians and bakers around the world will be celebrating tomorrow as they do every year.